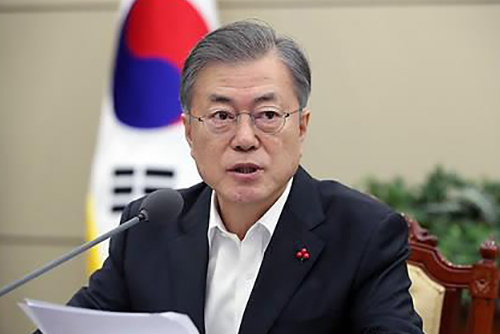 President Moon Jae-in said that South Korea has received the highest score yet in Transparency International's Corruption Perceptions Index. He said the international community has recognized Korea's efforts to eliminate the corruption and social ills of the past. Deputy presidential spokeswoman Ko Min-jung said the president was told about the 2018 index rankings from chairwoman Pak Un-jong of the Anti-Corruption and Civil Rights Commission during a Cabinet meeting on Tuesday. Ko said the president asked the commission chief for sustained efforts to continue the trend against corruption. According to Transparency International, South Korea scored 57 out of 100 in the Corruption Perceptions Index last year, three points higher from the previous year. It jumped six slots to rank 45th out of 180 countries. Giving a report to President Moon, Pak said that irregularities continue among those in power and corruption persists in everyday life. She vowed to consistently implement anti-corruption measures to prevent irregularities, stiffen punishments, close loopholes and remove blind spots.